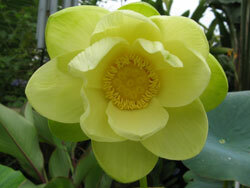 On September 1st, 2007 a garden friend gave me 4 seeds of her native American Lotus (Nelumbo lutea). Reading up on it online, I figured I'd give it a try and see what happens. The big seeds need to be nicked, so I held them in a vice and filed carefully until I could see the cream colored inside of the seeds at one spot. I put them in a glass with warm water on my kitchen window sill, and every time I noticed the glass I exchanged the water with warm tap water. In a few days the seeds sprouted. As soon as the sprouts were a few inches tall and started to reach out of the glass, I planted them in buckets. Cheap paint buckets bought at the box store seem to be just the right size. First I filled the buckets with mucky dirt. 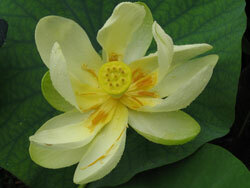 I am 'lucky' enough to have just that in my yard. I planted the babies, each in its own pot, filled it up with warm water and placed them in a sunny spot on the back porch. Shortly after planting, the first small leaves (silver dollar sized) came up. I added a little of the all purpose liquid plant fertilizer. 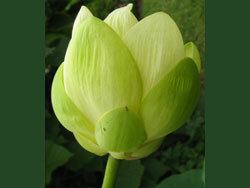 the temperatures dropped in January/February 2008 and the lotus babies quickly went dormant. I left them in the sunny location but brought the buckets into the garage during the coldest nights. 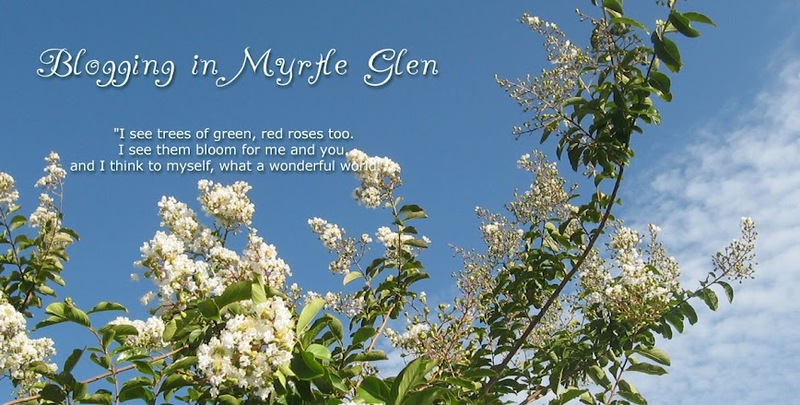 The days got warmer and the plants started to wake up, all but one. 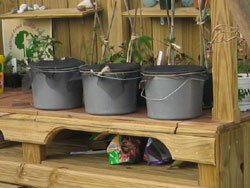 Until the leaves started to grow, I covered the buckets with screen material so not to invite bugs. Soon the first aerial leaves grew. They seemed happy in their buckets, and seemed to like the occasional all purpose liquid fertilizer. In May 2008 I found good homes for two of the babies. 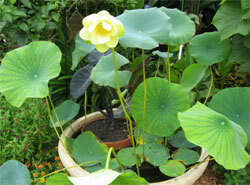 Middle of May 08 my lotus baby was planted into a three-gallon pot and placed in the 'Salad Bowl' with a canna, horsetail and water lettuce. A bubbler fountain adds oxygen to the water for some water snails and minnows, those have the job of eating the mosquitoes. In a matter of three months, I had to evict the horsetail and most of the water lettuce since the bowl got too crowded. 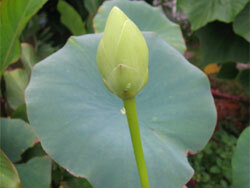 August 10, 2008 I can't believe it, not even one year from seed and I find the first lotus flower bud! It is still small, but growing every day.... August 17th is the big day, the bud opens up to become a beautiful, creamy white flower.